A pool deck is an area around the swimming pool. The most common image that comes to mind when the word decking comes up is that of a wooden deck. However, concrete is also a popular and highly recommended material to use. It can be used bare or topped off with other materials, like tile and stone. 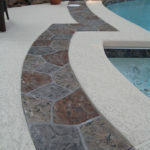 Pool decks are more than just paved surfaces around the pool. It is a functional element that serves as a lounging area, a transition from the house to the pool, a cover for the bare dirt underneath, and more. For all these reasons, it needs to be durable, appealing, and functional. Choose a material that has enough texture to keep anyone from slipping and falling. Surfaces tend to be more slippery when wet so it is best to test samples beforehand. A sealer mixed with an abrasive is a reliable solution to enhance grip. This, however, needs to be done every couple of years. The deck must be even enough to be comfortable to walk on. It hurts to walk on bumpy surfaces wearing flip-flops, let alone bare feet. Uneven tile or pavers could also cause tripping and falling. The sun can be harsh and it could cause a pool deck to heat up. You probably had the experience of having to walk on a scorching hot deck just to get to and from the pool. Choose a heat-reflective material that maintains a low temperature even in the warmest of days. The material you choose should be able to blend well to your home. Choose something that looks good and makes you happy. If you must, hire a designer to help you choose the right patterns, colors, and design concepts that would fit your property best. Find a material that requires minimal cleaning and maintenance. If possible, ask an expert which materials are prone to algae growth, mold, mildew, and the like. How long will the material last? How durable is it against damage? Choose materials that are able to stand up against abrasion, impact, stains, and other common damage.